This past Valentine’s Day I treated Nick and a few of our friends to some yummy cannoli from Vegan Treats in Bethlehem, PA. They made me lament the fact that Bethlehem is so far away. For those who don’t know, Vegan Treats started offering their cannoli online for Thanksgiving/Christmas in 2013. They also sold cookie boxes for Christmas and boxes of awesome looking chocolates for Valentine’s Day. An order of cannoli includes a dozen cannoli – 6 plain and 6 dipped in chocolate. I was a big fan of the plain, while Nick preferred the chocolate. The filling is creamy and sweet and the pastry was delicious and flaky. The cannoli are pricey ($48 for a dozen or $50 for a gluten free dozen), but definitely worth it! After all if I can’t get to Bethlehem, PA every year, at least I can get something delivered right to my door! I’m hoping they do something cool for Halloween and even though I don’t celebrate Easter, I wouldn’t mind another opportunity to get more goodies! Vegan Treats has won Veg News‘s best vegan bakery of the year more than once and for good reason. They offer a wide array of decadent treats including cakes, pies, donuts, cookies and cheesecakes and they all look so delicious it’s hard to resist the urge to buy one of each. Vegan Treats is also heaven for those who would rather not support the alcohol industry, like Nick and myself, since they don’t use alcohol or any extracts containing alcohol in their baking. Combined we spent about $60 on French pastries, doughnuts and brownies. Some were incredibly fantastic, while others were good, but nothing special. For pics and descriptions of everything we got check out the Flickr set. I couldn’t help but grin when I walked into Vegan Treats and somehow that grin managed to get wider once I found out they didn’t use anything with alcohol in their baking (their owner is straight edge). It took me a while to decide what to get and I ended up letting Nick choose first, so I could get whatever I thought looked good that he didn’t pick, since we were planning on sharing everything. We got so many desserts that I have decided to focus on my top 3. Before I wend vegan, my favorite chocolate candies were Ferrero Rocher’s hazelnut chocolates. The little nut on top of this cake made me ask what was in it and when I found out I had to get it. 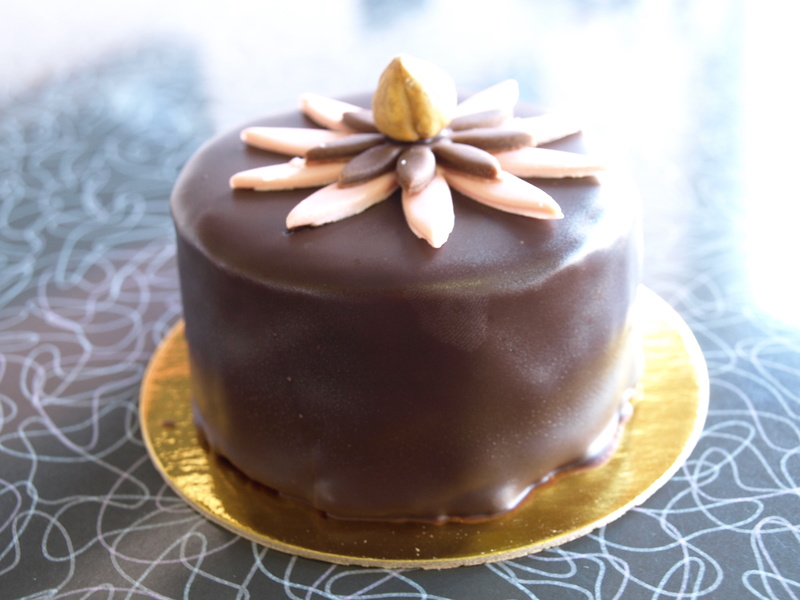 It’s a chocolate cake with a hazelnut praline frosting between layers, encased in chocolate ganache, topped with pretty fondant flowers and a single hazelnut. It’s like a truffle in cake form. Perfection! I haven’t had Tiramisu in ages and it’s a dessert that is hard to make right. Often it’s too strong or too moist and the subtlety of the different flavors is lost or it’s the frozen variety restaurants get that just tastes awful because it’s been frozen. 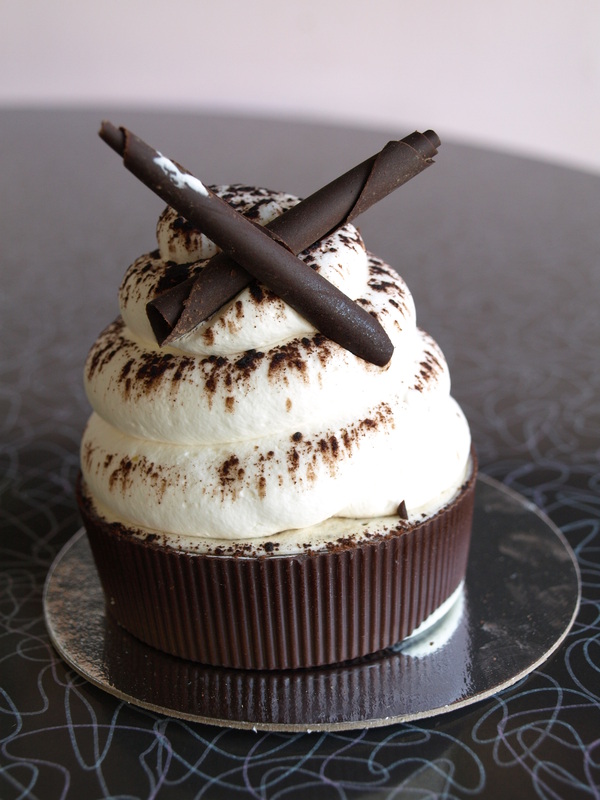 Vegan Treat’s Tiramisu is perfect! The cake was moist, but not too moist and the espresso didn’t overpower the senses. The cream topping was rich and fluffy and the chocolate shell crust and shavings made it the best Tiramisu I’ve ever had. This is a great choice if you’re a fan of rich desserts and if you like the combination of chocolate and coffee. Strawberries are my favorite berry. I like them in ice cream, shakes, popsicles, on cheesecake…you get the picture. This cake just looked like strawberry heaven and it was. 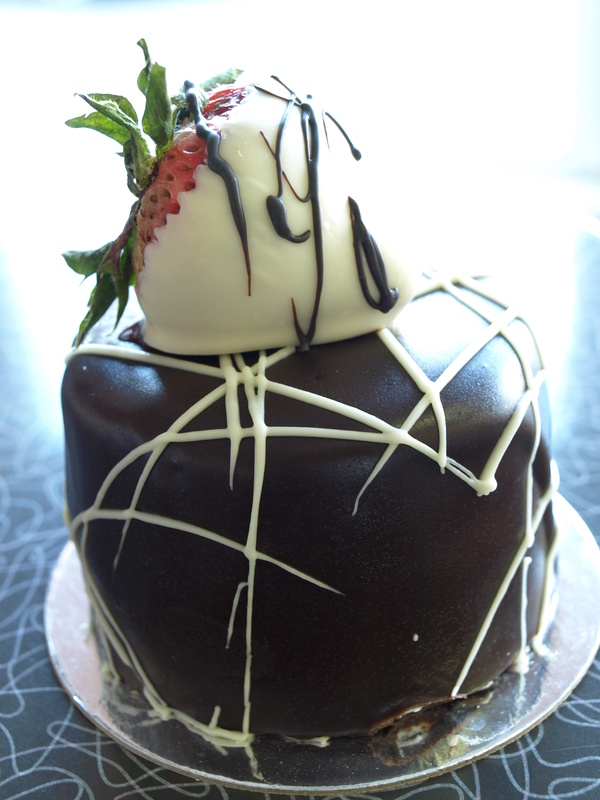 It’s a vanilla cake layered with fresh cut strawberries and a light whipped cream, encased in dark chocolate with a white chocolate covered strawberry on top. I’m a dessert fiend and chocolate is my greatest weakness. One of the few things that tempers my dessert purchases is that I don’t consume alcohol, and I take that to the extreme of not even consuming extracts such as vanilla extract. I had been told by my friend Michelle from the band Sick Fix that Vegan Treats didn’t use alcohol based flavorings in any of their products. When I walked into the bakery I had to hear it for myself so I started asking questions. Sure enough it was completely true. With that hurdle cleared, my brain exploded and I started ordering anything and everything. In the end I ordered 5 French pastries, 2 brownies, and a doughnut. I’m trying to list the top three selections I purchased but its too hard for me to narrow it down so succinctly, so instead I’m going to just go with the highlights. While Lisa was taking pictures of all of the items we purchased, I sat down with my Boston Creme Doughnut. It had been forever since I had anything like this. Lisa recently made doughnuts filled with jelly, but as cool as they were they didn’t match the grandeur of being one of my 2 favorite types of doughnuts before I went vegan – Boston Creme and Bavarian Creme. Needless to say, I had a brief moment of nostalgic bliss as I ate my vegan Boston Creme Doughnut. Next I want to talk about the two Brownies I had. To be honest, I’m more of a fan of the dense fudgy goodness of a brownie than of the fluffy airy texture of a cake. The Chocolate Peanut Butter Mousse Brownie was absolutely delicious and though I can’t remember with exact certainty what the other brownie I had was, it was also dense and delicious. I purchased 5 French Pastries and though they were all good, Death By Chocolate (which the girl behind the counter said was her own favorite) was just okay. It was pretty enough, but at the end of the day it was just standard chocolate cake with a thin shell of chocolate frosting. My favorite out of the 5 I purchased was the Peanut Butter Tandy Cake (I think that’s what it was called). 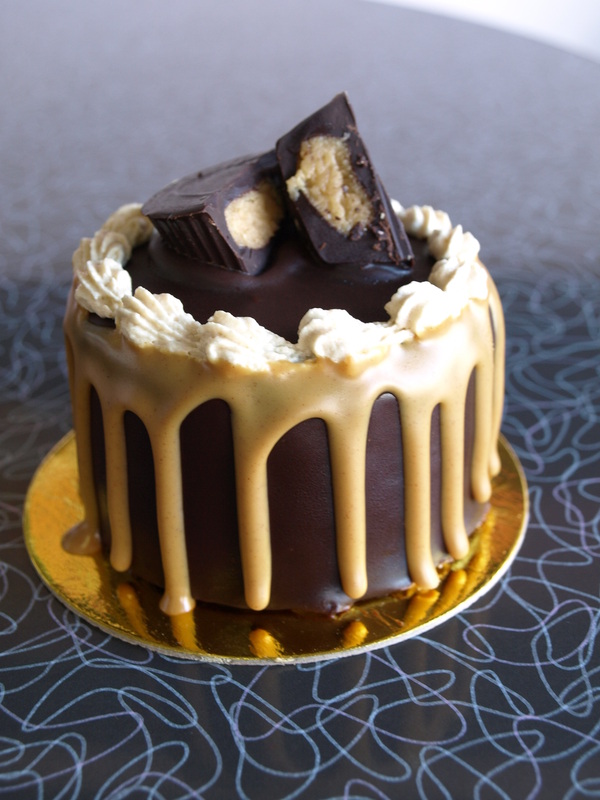 It was a mix of yellow and chocolate cake with chocolate and peanut butter decorations and a peanut butter cup on top. Strangely, despite zeroing in on all of my favorite things; pretty much anything with chocolate and/or peanut butter, the sleeper hit for me was the Hazelnut Praline cake. Maybe the pink flower just pushed it out of the running when I was making my purchases, but I overlooked it completely. I only got to experience it because Lisa bought it. In my sea of redundant dessert flavorings the hazelnut creme really stood out and got my attention. This was an A+ dessert.